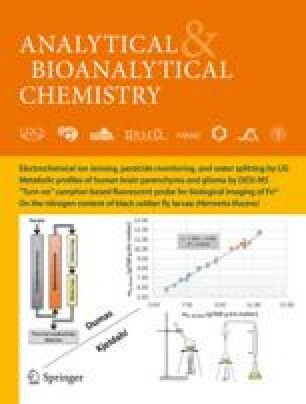 An analytical characterization of microbiological oxidation and reduction of sulfur anions has been performed with dual ion chromatography. The apparatus consisted of two chromatographic lines combined by a sample injection valve that allows the simultaneous introduction of a sample solution to both systems. With system 1 non-suppressed conductivity detection of sulfite and sulfate after separation in phthalate eluent was performed. For sulfide, thiosulfate and thiocyanate amperometric detection using a carbonate eluent was carried out on system 2. Parallel runs were possible for these species which could not be separated with one system. Optimizing separation and detection, limits of quantification of 0.02–0.3 mg/L could be obtained. The on-line coupling of a reaction vial to the injection valve was used to investigate the bacterial conversions, because the samples could be taken without contamination and air introduction. Thiosulfate was detected as a metabolite in both sulfur reduction and oxidation. Capillary electrophoresis with conductivity detection was applied as a complimentary technique for monitoring the bacterial sulfur oxidation. The results showed good correlation to the concentration values obtained by ion chromatography.